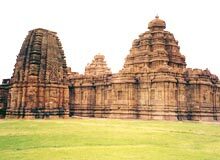 In Karnataka, Pattadakal is a small town that is renowned for its ancient temples. Located near Badami and Aihole, Pattadakal Temple can be easily reached by regular buses or private taxis from the major towns and cities of Karnataka. The Temples of Pattadakal, exhibhit the zenith of 'Vesara' style of Hindu temple architecture. Owing to its incredible temples, Pattadakal was titled a World Heritage Site by UNESCO in 1987.